You are here: Home / Heart Disease / Coronary Artery Disease / How Long Does Heart Bypass Surgery Last? How Long Does Heart Bypass Surgery Last? 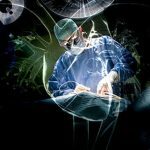 Several hundred thousand patients undergo a bypass operation every year in the US. Although the numbers are not as high as a decade ago (largely due to the number of stent procedures performed by cardiologists) bypass surgery remains the best and safest option for many patients with serious heart artery blockages. So how long does heart bypass surgery last? 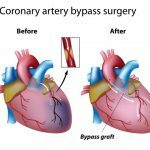 When asking, “how long does heart bypass surgery last?” It’s very important to understand the different types of bypass grafts used. The most important one is called the LIMA (left internal mammary artery) and is an artery that runs on the inside of the chest wall on the left side of the body. This artery is carefully taken down from the chest wall and almost always attached to the main artery that runs down the front of the heart called the LAD (left anterior descending artery / Widowmaker). The other type of bypass graft we will talk about is called an SVG (saphenous vein graft) that is taken from the leg and is a vein used as a bypass. Although there are other types of artery bypasses (radial, right mammary), for the purposes of this article I will concentrate on the LIMA and the SVG, as they are by far the most commonly used in the US. We call it the LIMA graft and it’s the gold standard of bypass grafts and almost always attached to main artery that runs down the front of the heart called the LAD (left anterior descending artery / Widowmaker). This is by a mile the most important graft, and in fact many people can simply live off the blood supply they get from this graft. The LIMA graft has superior biological properties to other grafts such as vein grafts and therefore has an excellent chance of staying open. 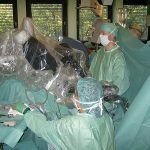 Now we can start to answer the question “how long does heart bypass surgery last?” Studies have shown that the LIMA graft is around 95-99% likely to be open and working at 1 month after operation, 90-95% likely to be open at 1 year – 5 years, and around 80-90% (even greater in some studies) likely to be open at >10 years. These studies show that the LIMA graft has excellent not only short, but long term results. Unfortunately there is only 1 LIMA graft but often patients have many blockages requiring bypass so we have to use veins or other arteries. Unlike the LIMA graft, the vein grafts has inferior biologic properties and is prone to degeneration and blockages. The LIMA has a remarkable long patency rate of up to 90% as described above, however studies of vein grafts have shown that up to 40% of vein grafts may be closed at just 1 year after surgery, with longer term studies looking at up to 10 years after bypass also suggesting that around 40-50% of vein grafts will block off, which is remarkably high. What Do We Do If The Bypasses Close Off? So far we have said that while LIMA-LAD grafts are an excellent option with great long term results, vein grafts are unfortunately no so good, and have an almost 1 in 2 chance of going down within several years of surgery. The good news is that the LIMA-LAD graft is the most important. And although the vein grafts may go down more frequently, if they do go down the chance of needing another heart operation is very, very low. If required, treatment can typically be undertaken using minimally invasive methods such as using stents. The decision to treat blocked bypasses depends on many factors. Often the blockage may be silent and without symptoms, in which case no specific treatment is needed. Some bypass graft blockages will present with symptoms such as chest pain, shortness of breath or heart failure, in which case further evaluation can be undertaken and the decision made on the best treatment depending on the results of tests such as stress tests and angiograms. Finally some of these bypass blockages may present as a heart attack in which case often the blockages can be treated through the use of stents and medicines. So How Long Does Heart Bypass Surgery Last? Lets summarize the article so far. If a patient has a LIMA bypass, it is almost 90% likely to remain open, even 10 years after the operation, and that is just great. For the other blockages where an SVG graft is used, the bypasses are about 50% likely to remain open at 10 years. If grafts go down its not necessarily a disaster, there are often good treatment options. Remember that the bypass was done to treat coronary artery disease, but that’s only half the battle. The same disease process still goes on despite the bypass and so the emphasis in these patients should be on treatments that can act to stabilize the heart disease. These treatments include medications, blood pressure control, cholesterol management, avoiding smoke, exercise, diet, and adoption of a healthy lifestyle. Now these are the truly life-saving measures. Open Heart Surgery – Incredible Picture Guide! my husband had bypass surgery which failed within a month and since then he’s gotten 43 stents this is over approx. 11 yeqrs? Mow he’s in the hospital and they said they cannot do anymore stents, front of the heart muscle is dead so they’re going to give him some diuretics and therapy. Is there anything else that can be done? 43 stents is fairly remarkable i would be amazed if that many have been put in, and more stents would likely be futile. A lot depends on the heart function. Medicines can do a lot of good with regard to symptoms and to treat heart failure. In advanced cases, use of left ventricular support devices, or even heart transplantation can be considered for suitable candidates. I had 4 bypass’s, 2 years latter one of the bypass’s was plugged up. They put in a stint. Gooing on 5 1/2 years now. I get a little pinching in my chest now and then and short of breath easy. I just don’t push myself like I use to. I had a 4 way bypass in 1999 a week before my 64 Birthday.My father and grandfather both died at 64 from heart attacks! I was worried!! Dr.Moon performed a 4 way bypass at St. Elizabeth s Boston used mammary and used Radial from my arm. I’m attempt you eat heat healthy as h advised. I workout at gym doing body pump weight lifting class 1hour class 2-3 times week, ballroom dance 2 times wk, and am still working! !I need to stay young as I had my first child in 2003 she Keeps me young Medication: 40 mg Atorvastatin and 400 mg C0 Q-10. At 81 feel great , thank you Lord! Wow that’s awesome. I just went thru a triple bypass sept 2017. I am58 years old. I am scared to death, have been emotionally depressed. I’ve been exercising everyday 45-60 minutes and trying to eat right. Right now my numbers are good for which I am thankful. I’m just afraid I won’t live very long. I hope that you have come to a better place with this. You sounded so frightened by in Feb. I pray that you are feeling better. I’m 74 years old. I’m a black woman and it’s been 3 years. I think you were running scared 45-60 min a day? whew! Did you lose weight? If you need to talk to someone I’m open to that. To: Suzanne and Denita: I had angioplasty and a stent put in my LAD (widow maker). It had a 90% blockage. It pissed me off bc I’ve never smoked and exercise daily. No other significant blockage and only mild CAD (coronary artery disease) Still terrified and interventionist has been reassuring. I’m going thru this alone. Divorced. This was in Dec, 2017. Any little chest pain and I freak. But I think you two are golden bc bypass is better than stents–especially if they use the mammary gland which tends to not get atheroma or plaque. Your husband is young and it’s good he’s responding. Bypass is probably what I would have preferred but they didn’t think I needed it bc not much CAD. You should be on Statins, BP Meds — and exercise. So, I think you guys are good to go, but I’m 72 and although not much heart disease, my life hs shut down. I wish I were your ages again. I think you’ll be here a long time. try to not worry and get exercise, watch diet, take meds. Seriously. Randy—Hope you see this reply, as it’s been nearly a year since you posted. Your posting date of March 9th, 2018 caught my eye. On 3/9/18, I came in from a run (I’ve run 5-6 miles every day for the past 45 years). Sat down on our front porch with my wife, and next thing I knew, I was waking up in CICU. I had suffered a sudden cardiac arrest after that run! Never had any symptoms. Never any pain. All was normal…except my LAD was 95% blocked. My wife immediately began CPR on me, on the porch. And kept at it for over 15 minutes until paramedics arrived. The rest is a long story, but the short part is, I survived! Had one stent put in that day. However, six months later, the stent became blocked and I had open heart surgery, with a bypass using the mammary artery. It will soon be six months since that surgery and one year since this adventure began. Needless to say, it has been quite a year for me and our family. Right now, I’m doing really well I think. Exercising ever day, including a four mile walk each morning. Ready to begin a little running pretty soon. Now I have to say this, I still look over my shoulder every now and then, wondering when the next “event” will sneak up on me. But mostly, I look forward, not backward. I want to be here for my hero—my wife! And, my two grown sons and their families, which includes six grandkids. And, I’m doing all I can do to give my heart a fighting chance to keep working hard for me! One day at a time, y’all, one day at a time. Right now, I’m doing really well I think. Exercising ever day, including a four mile walk each morning. Ready to begin a little running pretty soon. Now I have to say this, I still look over my shoulder every now and then, wondering when the next “event” will sneak up on me. But mostly, I look forward, not backward. I want to be here for my hero—my wife! And, my two grown sons and their families, which includes six grandkids. And, I’m doing all I can do to give my heart a fighting chance to keep working hard for me! One day at a time! Denita, I had bypass surgery when I was 44 years old. I am 67 years old now and have had no symptoms since surgery. I had a heart CTA last week and it showed good results. I still work every day and have been active since the surgery. Don’t give up. My husband is 43 and he had a bypass surgery. One of his arteries was 100% blocked. We want to talk to someone to understand the lifestyle changes better. Can you email us your number to talk to you. Great man. Even I had Bypass Surgery at 45 age. What precautions you have taken to sustain so long remarkably ? I cant control urge of smoking atleast 2 cigarettes everyday & Drinks twice in a week. Please tell me your detail your lifestyle to survive. I am a diabetic too but have good sugar & cholesterol control. Did you have triple bypass?? Quadruple?? I just had Quadruple.. I also had triple by-pass surgery at age 45. I’m now 66 1/2. See my cardiologist every 6 months. So having by-pass surgery isn’t so terrible and life altering as a lot of folks think. I was back to work and playing golf 4 weeks later. I had triple bypass sug 2 months ago 50 year old female scared. had by pass surgery around Feb. 24, 1980 and again in june of 2004 and as of 2017 am doing ok.
Rodger, how old were you and how was your health at your first pass surgery? Hi, my husband (69) had an 8-way bypass 5 yrs. ago. 4 plugged right away and he ended up back in the hospital. They put 2 stents and he’s been better than ever for the past 5 yrs. He is on a very good diet, exercises on his stationary bike every day. He also takes good vitamins and is also on EDTA oral chelation every day and takes zeolite to help keep arteries clean. He, too, is acting very healthy and is off all his meds. NO Statins. He does have type 2 diabetes and he stopped taking metformin and is taking a more natural glucose control “Sensolin” which is working great! We are so happy…celebrating 50 yrs. together. Good luck to you and your husband. I had a triple cABG bypass in 1993 at age 32. I am now 58. I have had three stents placed. I am overweight, take lots of meds, and don’t exercise. I do have angina and can’t do what I used too. But, I’m still alive. the urgency wasn’t fun, for sure, but it did save and prolong my life. I started taking 1000 mg vit. c twice a day and cannot remember the last time I had a cold. I’ve been on this regimen since 1990. Used to get a cold and a sinus infection almost monthly. WOW, a lot of different outcomes! I had an Off-Pump Double Bypass in June 2010 at 62 and my outcome is great to this day almost 8 years later. I had none of the noted symptoms of a heart attack but I just knew that something was wrong. I drove to the local hospital’s Cardiac Emergency room they did the usual….put me on a gurney rolled me back and checked my cholestrol (160) checked my enzymes twice (negative), and they wanted to either release me or have me do a treadmill test, neither choice was acceptable to me. I then contacted my well-respected Internal Medicine Physician and told him that something was going on and that I did not want to be released or do the treadmill and in our relationship he knew that I was not a faker or an alarmist and that I was in touch w my body. With his help I was admitted and scheduled a cardiac cath the next day..results 90 and 95% 2 blocked arteries. Luckily there was a heart surgeon there who was able to perform off-pump surgery and had surgery the next day and out 3 days after. I took my rehab seriously (prior to my surgery I walked 3 mi 6 days a week for the previous 18 years) and began walking immediately upon getting home and have been exercising since…that is my lifeline. I am also off all prescription medications as of 3 years ago and continue my healthy diet. I think that so much of an individuals outcome and longevity is due to many factors, 1. What kind of overall good or bad health you were in when it happenned, 2. How many bypasses that you needed 2. The skill of the surgeon, 3. How you view rehab and recovery and how committed you are to it,4. Healthy Diet and Exercise, 4. How you view yourself following the bypass, 5. Your age, your positive or negative outlook, your stress level, etc all affect your outcome. Good luck and long healthy life to all of us!! I am 70 & had a quadruple Lima By Pass using the Mammary artery on April 10th. 2018. I go for Rehab.twice a week, 45mins each class. I notice a 1.5 cm. gap in the sternum where I was opened up. Do I need to be concerned? My Cardiologist & family physcian just ignore it and don’t bother to touch it either. It depends on what the operating surgeon feels about the wound. How are you since your surgery? I had a CABG×4 on Feb 29th 2016. At 46 years old. Ended up doing an extended stay of 27 days due to CHF and 3 thoracocentesis. Horrible. Anyways, its been over 3 years, I feel great besides a few aches and pains. With the described disease, CABG would appear to be the best option. Hi I must admit to some worry with the article. I live in Scotland and had my triple bypass in 1994.
length of time the procedure would last. What I can say to Andy is, this is one of the best things that you can have done. Of course the surgery is complicated but the results of having it done literally give you a new lease of life. I was 54 and I am now coming up 76 and I would not have been around to see my grandchildren grow and enjoy their childhood/adulthood. I am hoping to beat all the records for longevity and say to Andy – Go for it!!! Kindly give us all your eating habits , etc so that we too can follow the same so as to keep my cabg grafts in good condition. I am on a complete plant-based diet as recommended by Dr. C. Esselstyn, McDougal, et al. It simply works. I am following his “reversal” diet and I have been able to reduce my meds to a low level. Thank you for posting because I just had a heart attack then a sextuple by pass done. Reading how quick the arteries clog up again is really depressing . I know a lot depends on my health life style etc but what I had read was depressing. Your post was uplifting ! Thank you. My husband had a quadruple by-product (carb) over 19 years ago and has beat the odds even though back problem have prevented him from exercising. He has one graft that was stented twice at 10 and 12 years post surgery, it has now closed and a second graft that is almost closed. With two grafts remaining he is still going strong. He was only 47 yrs old when done and will be 67 soon. Thank you God and modern medicine for letting him see 15 grandchildren born and will soon have two great-grandchildren. Life saver!!! You got the right additude! Hi I had a double bypass 33 yrs ago and recently went in to have a cath done when they reached my catholic it collapsed in which case they put a 20cm stent in its been about 2 month moving about slowly but at 73 still alive. Don Naples me. Maine medical did the procedure very thankful. Great people there. Had4 way 15 years ago. Great hospital and doctors. My bypass was in 2000 and was for 5 vessels. I was 58 now I am 75. Had one stent put in on 2012. So that is my 17 year history. I am careful in what I eat. No candy, cookies. Watch my satcherated fat intake. R u on a special diet? They used a vein from your leg for the bypass? I was 80 when I had a 5 CABG. I am now 81 and 10 months after surgery. I am hiking, playing pickle ball 4 to 5 days a week, dog walking, aerobics water and land 3 to 5 times a week. Juicing vegs and fruit, raw honey ,tumeric, cinnamon, cloves, ginger, cayenne, lots of berries, apple cider vinegar, yogurt, kefir, pomegranate juice, avoiding sugar and flour. Tell me if my diet sounds good. Feeling very fit and active for an Octarian. You sound like the model citizen!! Glad to hear your doing well. What kind of diet , excercise etc.. Have you been on . I had triple bypass surgery in 1989 at the age of 45. I am now 73 and just passed another “nuclear photo shoot.” a little humor. I take 80 mg of Lipitor, I stopped smoking at age 45, started to exercise and was very careful with my diet. I also had a 4 way by pass at age 52, now age 72. No stents, no angina or shortness of breath. Normal scans too. Take 20mg of lipitor, don’t smoke, and play golf 4 times a week. So far life is good. I had a triple at 47 and am now 70. Just had a problem when I was out walking. I was going up the same hill I go up almost every day and couldn’t make it. Ended up in the hospital, no heart attack, but I needed a stent in the main artery. It was 90% closed. Now, 4 weeks later, I’m back running and hope to keep going. I had quadruple heart bypass surgery 15 years ago at age 60 so you are an inspiration to me. I am doing ok now and want to go for your record of 22 years. That is awesome. I see a cardiologist once a year and have an echocardiogram each year or every other year depending on what the cardio doc thinks. I am on my third cardiologist as we have moved around in retirement and they have all been easy to talk to and I feel like have given me good advise. I take blood pressure meds, the same ones I have been on for nearly 20 years now, stating drugs for 15 years now and a low dose aspirin. No changes in my medications so they are all generic now and affordable. Do you follow a diet or just eat what you want? Do you exercise? Thank you for your posts. Two months ago today I had quadruple bypass at age 60. When I asked the surgeon about my life expectancy since the surgery he said the bypasses should last 10 years. When I asked about after that, he just raised his shoulders. I was feeling quite low, expecting only another 10 years of enjoying my grandkids. I do have a question I have not seen addressed…..I don’t normally have dreams that I remember, but since surgery I have weird crazy dreams. Sometimes I remember them very specifically, sometimes only vaguely. But they always leave me with a very unsettling feeling. Anyone else experience this? Any idea how long this may last? Again thank you for your encouraging posts. Im not sure about the dreams, possibly med related? With regards to the 10 years, the main bypass on the front of the heart, the LIMA is known to last a lot longer and it is the most important. If the others fail there are plenty of other treatment options so don’t worry about that, no reason you cant do well for a long long time. I had the CABG x2 done. I was 99% occluded at the LAD. It was the best option. It’s the most chance of long term success. They did the LIMA procedure as well. The first 6 weeks or so sucked but got better after cardiac rehab. I’m 52 and had the surgery just prior to my 51st bday. I had what they describe as a silent heart attack. I had no definite symptoms and hey found the blockage with a hear cath. I also happen to have a great cadiothorasic surgeon and cardiologist. The LIMA also cuts down chances of secondary infection which is common with an SVG. New spouse and very upset about my husband’s condition. But the frustrating part about reading these wonderful comments are the acronyms. What is LIMA and SVG? I’m worried about post infection. Start with an evaluation and likely some form of stress testing to determine presence and severity of disease. Hi Doctor Ahmed, I had quintuple bypass at St Thomas in 2005. Never had deart attack. I am out of town, experiencing what I call unstable angina, very uncomfortable. Dissipates while walking on tredmill. I am 76, will a stent help. You need an immediate evaluation prior to any procedural decision making. SPECTRUM provide good set of options. I am on medications since my triple bypass surgery 9 years ago. I have blockage, was so bad in one couldn’t put in stent. How long do I have just on medication treatments? Hi the same thing just happened to me I wish I could talk to you! Should be about time, according to this article. Good luck! Hi…I just lost my dad a couple of weeks ago. He had bypass surgery done back in 94. According to this artile, 10 years would have meant that we would have lost him in 2004. With God’s grace and his good spirit, he stayed with us for 24 years after his bypass…so hoping your dad is ok and don’t stress. Cannot express how important it is for him to take his meds daily and on time!!!!!! I found your article most enlightening, thank you. In South Africa, the preferred method is the SVG (saphenous vein graft), and not the LIMA (left internal mammary artery). My husband underwent a triple bypass on the 6th of September 2016, and was discharged from the clinic on the 12th of September. The surgeon chose to perform an SVG; the vein in question was removed from his right leg (the incision runs from the ankle to the upper thigh). Though I was advised by a cardiologist in the UK that the LIMA method was the preferred method, my husband’s surgeon chose to use the SVG method. The surgeon’s decision surprised me since my husband’s legs have been broken on five separate occasions in the past, and the damage to his bones, muscles, tissues, and veins is very evident. I was therefore taken aback when his surgeon insisted upon utilising the SVG method, and using a vein from one of his damaged legs. It is important to note that the surgery was not an emergency, but was performed on the 6th of September 2016, a full five days after my husband was admitted to the clinic on the 1st of September (the day of his heart attack). See if you can get the operation report, typically they will use the LIMA, then use the SVG for the other grafts, i am almost certain that is what you will find. I had second bypass surgery it is very serious, “but” we have great Doctors today in our time of life. I’m a 63 yr. young lady, at 43 I had my 1st MI by age 50 I had 8 balloon angioplasty’s 2 more serious MI’s they were massive, at age 50 my 1st bypass surgery> Then, the next 13 yrs 4 serious MI’s altogether 12 stents> At age 63 I had extreme blockage again, I had to have a second bypass surgery> I ‘m going on 6yrs. with this surgery now, God has brought me through so much, he always had the right Dr. at the right time. Getting over the second, may take just a little bit longer, not much> I lived in pain after the 1st bypass surgery, I’ve done so well after the second, I’m amazed> I read Dr. Ahmed’s article’s & feel better, everything will be okay, we have great medical Drs.> Thank You. Ms. Betty. I had a triple bypass in Glasgow in 2000 and have been in excellent health since now at 78 this week I feel very lucky indeed Dr saidI probably had hereditary cholesterol problems. No problems since. Had 4x bypass done 10 months ago, had new stress test done on 9/15/2016, received letter saying blockage in the artery supplying the inferior wall of my heart. Contact office and set up cardiac catheterization. Looks like 1st letter before 4x bypass. What happened? What is the inferior wall of heart? Been takeing med. and eating and working out as told. Raneska 500mg X2. What think you? It would be hard to answer without seeing the images to be honest. What was the reason for heart cath? 12 years ago, I had a quad bypass using the internal mammary artery and saphenous veins. Three weeks ago, I had a heart attack followed by a stent placed in the internal mammary artery which was blocked. It is my understanding that the transplanted veins are occluded and stents cannot be placed because the walls of the veins are “mushy” and the stents would push through the walls. Does this make sense to you? If so, what lies ahead? This really depends on a lot of factors. I would have to see your cath films to comment usefully. HI I had an attack on the 9th August and got the Angio done and the Dr. told that he did a stenting for my RCA (3 drug coated stents ), and also say have a LAD Large mid LAD present total occlusion, agioplasty for LAD was aborted as guidewire crossed the first acclusion and stopped at the second. and planning for CABG LAD and diagonal after three months. Clearly online i cant safely recommend a specific operation. It sounds like the RCA was addressed during the heart attack and you have residual LAD disease that locally was not amenable to PCI. In that case LIMA-LAD bypass surgery with other grafts as required can be an excellent long term option if recommended by a specialist. Heart surgery is a big deal to be taken very seriously. Im not familiar with that location. If there are concerns you should probably go and get an opinion from Dr. Ahmed at Princeton Baptist in Birmingham as he wrote the article! I work as a nurse in many open heart units, and I’ve heard the care there is simply phenomenal. It depends on a lot of factors, i would need to know a lot of details about other illnesses, how he is in general, and what his anatomy looks like to be able to comment, in some cases redo surgery is a good option, particularly if the risk of operation is acceptable. Not sure what the Dr’s are going to do because of his blockage in his heart . I would recommend he is seen by a cardiologist prior to the procedure if possible to determine his risk if anything. I had a 5 way bypass 29 years ago. Just had my annual stress test and cardiologist checkup. Everything going great. What is longest lasting lima you have heard of without having any stents or such. What is your diet and lifestyle. I had 5 vessel in 2000. 17 years later 1 stent in 2012. OK since then. I watch my fat intake. But no excersie. Do u? Since then I have maintained a healthy life style with regular walking and a careful diet as I had a very high history of cholesterol at over 280 which i have now brought down to the 110 range. However I still have severe pains in my chest, mainly around the area which was opened and since I have a young family these pains are frighting. Dr. Is this how it is 5 years after bypass or what sort of treatment should I look for as I have done several exercise ECG/ECHO test which showed the arteries were working well. Your issues may potentially be related to sternal wiring issues. Have you had a chest x ray to assess. I also recommend seeing the surgeon that performed the grafts to discuss the potential for sternal wire related pain. I had a CABG (7 bypasses) performed 14 years ago. I feel fine, and recently had a nuclear test done 4 months ago, whose results were okay. I’m about 70 years old, am a vegan, and am health conscious. I am wondering with that many bypasses done on me, what kind of outlook do I have. My total cholesterol is about 105, with an HDL of 45. My HDL used to be 23 before the CABG. I take Fenofibric acid and simvastatin. 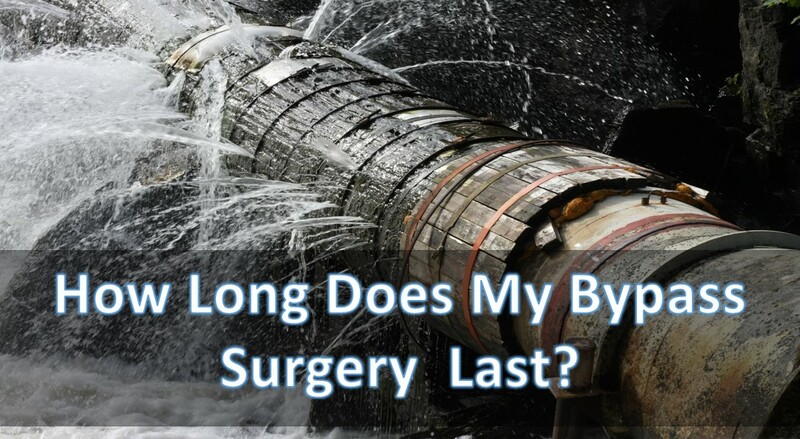 I was told by a cardiologist that the longest time for a bypass to last is 25 years. Is it possible to have another CABG when the 7 bypasses become non-viable? I am concerned very much by that. Thank you, sir. Most likely you would have stents if the bypasses were to block. When your vein bypasses have already been stented is a second bypass the option? 5 vein bypass 2002 using svg veins. Heart attack in 2014,three collapsed grafts,one was stented. 2017 blockage in another vein and was stented. So I have two completely closed,two stented and one is good. The LIMA is available to use. I am 57 years young. I wouldn’t be able to comment responsibly about that without knowing your full story and seeing your films. My CABG( triple ) in 2011. After 5 years I went to the Doctor for a check up last weak with a complaint pulling of left shoulder now and then consequent to walking for two three days. I am using Prolumet XL 50 ,clopitab 75 A and Rojucar 10 tabs. . I am not a diabetic .my BP is UNDER CONTROL.. The Angiogram report shows that LMCA <50 . Ramus a large septal collateralizIng supply. No abnormalities in cholesterol report . All the other artery branches are 100% stenosis. I am now 69 yrs aged . the physician advised Medical management. is the second CABG necessary? Is medical management correct decision? I would need to see the images to comment on this case. I Had Bypass surgery when I was 49 I am 70 in 2016 I am on blood pressure and colestral medication . Every thing is fine I eat everything i like but not a lot. I walk 2 miles every day and drink a lot of water. I feel 70 not so good not so bad I travel and socialize with friends. I hope to live till mid 80’s the same way I do now. Enjoy life and God will take care of the rest. Had heartattack on 12 19 83 bypass on 2 22 84 what has been the longest one has lasted? Hi’ Rand,had a triple by-pass in Adelaide South Australia back in 1982 ,still feeling great after 35 years! Hi Suresh,sorry I’m late in replying! I don’t know if there is a ‘for sure’ way of keeping the blockages away,but I just followed what the surgeons suggested , most importantly trying to exercise every day, I’m now 80 and still try to walk a couple of Km each day and try to stop myself from sitting around to much! I don’t eat a lot of fatty foods but still enjoy having a good and sensible couple of meals each day. I was told that my blockages were most probably ‘hereditary’ and yes it certainly has run through my family, BUT! ever since the op; back in 82 I have taken 1/2 Disprin every day and kept on with the statin tablet, seems to have done something right! Most importantly I have stopped myself from worrying over every little thing that used to occur! stress is a known killer, so now I just say ‘forget it mate’!!! Good luck Suresh and you’ll make old bones just like me! I had a double by-pass 8 years ago. I was just advised by my Cardiologist that as veins from my arm and leg were used that they would deteriorate and I would need another operation shortly. Should I seek an angiogram to minimise my risk of a blockage causing a heart attack or should I wait for symptoms to present themselves. If the veins do deteriorate then will I need another bypass replacing those veins or just stents. The length a bypass will last is varying, I’ve seen as short as 1 year and as long as 30, the key is to continue to aggressively treat risk factors. In general one would wait for signs or symptoms to appear. At that point, once symptoms appear testing such as stress testing may be indicated. If there are blockages in vain grafts, they can often be treated with stents, or if the grafts are closed stents in the native vessels may be an option. In some cases, redo surgery would be advised. Its different on a case by case basis. Told I’m not a candidate for another open heart. Prescribed meds. Do I have any other recourses? I would need to see the images to comment on the stent options available. I had triple by pass surgery three years ago in 2013. Am doing great and expect no further problems provided I do take my meds every day and no prediction was given me how long this will last. I am stable and generally healthy at eighty five. Luckily for me I never drank alcohol or smoked. That definitely was a plus for me. Just the wrong foods that built fat tissues in the veins and arteries was what contributed to my problem. Also, in 1994 I had a pacemaker placed in my chest to give the heart proper rhythm and timing of so beats per minute. A m on my third one. They last an average of 10 to 12 years. My mom had a triple bypass last Feb 2016, at the time of the surgery they didn’t have time to fix one other vein. They informed us that it was still at 50%, now we have found out that it isn’t doing so good. The doctor says they are afraid to open her back up, my mom also has a kidney transplant that is being affected by all of the medicine she is taken not only for her kidney but also for her heart and to top it off she is a diabetic. I am assuming you would side with what her doctor says and not touch her. But was wondering what you say in this instance. In general 50% lesions are treated with medicines. If a treatment was required in the future, its likely she wouldn’t be opened up, rather a stent placed. I had a triple by-pass back in March 1982 (35 years ago) and still feel ‘terrific’! ,I walk a couple of km or more every day and eat sensibly and most importantly,’keep happy’! i had a CABG in july 1994 (triple vessel disease).The docs put LIMA to LAD & three saphenous grafts.The venous grafts got occluded & they put 3 stents in 2006. My cholestrol & other parameters are within limits.I am a non smoker and walk regularly 4 kms. I sometimes get angina especially after walking after a heavy meal.Otherwise i am ok and eat sensibly and socialise too.Doctors have told me that as long as the LIMA to LAD graft is clear i should not worry. My husband had a quadruple bypass in December 1993 using veins from the back of his legs it was done at the Royal Brompton Hospital, by Professor Yacoub, he is still going strong at 81 years, he still does daily exercise, also using weights, now a non smoker, gave up smoking after a heart attack in 1991, he eats a fried breakfast, light lunch with a glass of red wine, eats plenty of fresh fruit during day, cooked meal at 5.30pm with meat, or fish and veg, walks daily. takes a daily aspirin, also 20mg Simvastatin, 50mg Losartan. He was told that it should last 10yrs, so at every year passed he thanks his lucky stars that he is alive and kicking, so he is very happy and so am I. It all depends on clinical stability. In unstable patients of course its difficult to optimize as surgery is urgent. In stable patients optimization of other problems can improve outcomes, for example breathing in patients with COPD and sugar control in diabetics. In stable patients, activity is important, those that are up and about will do better and therefore in general activity as tolerated is advised. At the age of 48yrs in August 2013 I had a serious MI (due to lifestyle) made more serious by my delaying seeking treatment (due to a severe attack of stupidity). 4 x CABG in October ’13, LIMA to LAD + 3 x SVG. I’ve been left with reduced heart function due to some dead heart muscle consequential to the MI and aforementioned stupidity. Last recorded ejection fraction was mid-40s % (hard to assess accurately due to dead heart muscle). 1. Limit my dietary saturated fat intake to 20g/day (thank-you food labelling), plus moderated alcohol intake. Non-smoker. 3. Taken up cycling. I ride 130-170km/week which corresponds to roughly 5 hours of cycling/wk. I get my HR into the 130-150 range for average and peak at mid to high 160’s on a decent hill-climb. Heart rate rises in response to exercise and drops rapidly following. I find cycling exhilarating partly for endorphine rush and partly because I can ride with ‘normal’ people km for km – I know I’m alive when I’m on my bike, but I digress. With that ‘life-style’ I am a normal body-shape/weight, have mid-range normal BP and a resting heart rate mid forty’s (45 as of today) assessed by FitBit (which makes me an ‘athlete’, verging on ‘elite athlete’!!). I am completely asymptomatic to heart disease, although I was right up to the MI. So my question is, assuming I maintain my lifestyle, will I ever need treatment to my SVG grafts for blockage or is blockage inevitable eventually bearing in mind I might live another 30yrs? Just a note to anyone who’s contemplating CABG. If you’re advised it’s best for you then do it! It is about the most invasive surgery anyone will ever get (they open your chest for goodness sake! ), but it’s been done so many hundred’s of thousands of times before around the world over decades of development that every possible complication has been seen and can be managed, so it is a relatively low risk procedure. It does have risk, not least of stroke, but far less risk than hoping your heart will improve without it. I am in a similar position – are things still good? My mother is 59 and weighs 68 kg. She was feeling breathless on walking about 1.5 km and palpitations. Ecg was normal. TMT was advised . After that coronary angiography was advised. In that 90 pc blockage was shown in LAD. Doctor advised MIDCAB (LIMA-LAD) surgery. My question is that whether stent ing was not an option And Which is a better alternative in this case a stent or MIDCAB surgery. It depends on the type of lesion and its location. I would need to see the images to comment further. In many cases, for single vessel disease, a stent is a good option, unless the anatomy would suggest otherwise. I don’t know of the official documented record however i know of many people with bypasses in the early 90’s doing just great. Tom Green,I had a heart attack and a triple by-pass back in 1982 in Adelaide Australia at the age of 45, had one by-pass ‘kink’ back in 1990 and a stent put in. Am now 80 and doing just great! I don’t think that there is any ‘set’ time for us,but I am sure that our life style afterwards helps tremendously, we have a good laugh every day ,eat sensibly and try to walk a couple of kilometres if possible every day. Home recovering from surgery. Had 97% blockage in neck artery, but no bleed. Plaque removed and now resting at home. Had double bypass in ’94, but have always been active with weights, walking and bike riding. Mini stroke fooled me, as I thought it was my Rx for eyeglasses causing slight headache and vision issues. We garden, process and eat our own vegetables, with little if any salt added. I’m 80 now. Will take as many more years as I can get. Also, I haven’t smoked in over 40 years and limit myself to one bottle of hard cider per day. Glad we paid attention to how I was feeling and got into the ER asap. Stay positive and be good to yourself! My father heart condition is given below, He also has Diabetics. His Health is not good wt 54 kg for Height 5’6″ . Plz suggest me what process i must follow. LMT: 70% distal LM stenosis. LCX: 60-70% osteo-proximal stenosis. Principal OM has 95% bifurcating stenosis at mid Part. RCA: Dominant. 80% osteo-proximal stenosis. Distal RCA disease free , Graftable. Hello…I had my by pass a week and a half ago. My first one. I had a stent in the LAD. Since my surgery. ..I dealing with depression and anxiety. Is this common and how long can I expect to feel these?.. Is there things I can do without taking medication? .. Such feeling can be common after major surgery and may often improve with time. Did you try enrolling in a cardiac rehab program? My husband had a 6 CABG done a year and a half ago. He was only 47. The worse thing he has noticed since his surgery is a severe and constant foul smelling sweat that drenches all of his clothing and our bedding. I have to wash our sheets and bedding every single day. We have asked many specialists only to get the “brush off”. There obviously has to be a reason for this??? One other thing we notice is, when he works himself hard his breathing is very hoarse, and almost like he’s gasping for air. He’s had a lot of testing done and everything looks fine??? He’s also shown signs of ischemia. Horrible stomach problems, food that won’t digest, vomiting… He’s now on 4 different antacids, among a medication to force his food to digest. He just had a scope of his stomach done and the lining is very thick and irritated, as is his esophagus. Any opinion on all of this? I’m 71 years old and a serious recreational road cyclist. I had a quadruple bypass 17 years ago. The heart has been performing outstanding, (maximum HR on bike is 175.) About six months ago I’ve started to show exercise performance problems that are now being investigated. The heart is the suspect. Will soon have a CT Angiogram. If there are blockages I will have to decide between CABG or stents if I have the choice. Right now if that situation emerges I think I will go the bypass route. I don’t think a CT angiogram makes sense, i think a form of stress testing makes more sense. In your case the physiologic information is more important than the anatomic while starting the investigation. I’ve already had an echocardiogram plus a Thalium stress test and scan. Everything within acceptable parameters with the usual individual EKG idiosyncrasies and a long standing moderate diastolic dysfunction. My cardiologists theory as I understand it is that given the age of the grafts and that there are also branches off of the arteries that likely a certain area or areas of my heart are getting less blood flow because of limited or spot impairment. That general theory seems likely given my subjective exercise symptoms and the real time performance data recorded while riding my bicycle including: power output, heart rate, cadence, speed over varied terrain, distance and temperature. (I’ve lost 20 percent of my performance average power plus have had inexplainable heart rate performance in the past six months coinciding with subjective symptoms. The CT angiogram, (or perhaps an angiogram for certain reasons), are now the next step. I am currently 60. I had a quadruple hypass anout 3 years ago. I dont have insurance so I never really get any follow up. Ive had a couple of ekg’s when I went to the er for other reasons. Guess they were normal. I dont have a whole lot of faith in them. I started having angina at 48. I took one of my dads nitro pils and it worked. So I knew it was heart disease. I got a doc to prescribe them and I know Id be dead without them. My angina began from my lower jaw down my neck into my left arm or both arms when it was bad. I was very scared of cardiologists. But, my 59 yr. I ld husband doed on Thanksgiving in his sleep while we c were dozing on separate couches watching fooball.. We had an autopsy g one egen though they already said it was hos jesrt. It turned out that he had several old M>’s before. Can that happen with no sumptoms? My bloodwork with fats, and genetic factors is horrinle. But I considered jom to be bu)let proof. No heart attack nmore angina..
A )ot b of my b life b I dod follow the Mcdougall, Essylston etc lifestyle. But I began smoking after quitting at 22 at around c 42. I switcjed to a vaporizer for a year. I loved not having to smoke. I can afford one again and go get checked, etc. In late April. I will get 1904 in survivors benefits i take clonidine for high blood pr.othing else works. Metoprolol, which keeps my low heart rate even lower. And clonazepam and gabapentin for anxiety. They all work very well together grateful for them and I want to live a long life. But if I try to add a statin I am so weak I can hardly move anything besides statins or juicing help to correçt high lipids? I feel a bit like I am ruining my new arteries. So yor thoughts on nicotine vaporizers lowering nicotine over time and a replacement for statins. I read about red yeast rice being a natural statin. I don’t know. Your thoughts? My email is because I am a former chiropractor. I am a 57 year old male. I’m not overweight, I’ve never smoked and I’m in good shape. Had double bypass surgery last May. Before that I ran a lot. I would travel around to meets and run the 100m dash. I did well in my age group. But with this came a lot of hard training. I know that exercise is essential. But can I train as hard as I did before and run a 100m race wide open. I have not been able to fine this kind of information. I did ask my cardiologist. He said no, that I was a heart patient now and had to learn my limitations. Is that right? I don’t want to do anything to put my life in jeopardy, but would still like to compete in these races. Can you please give me your input. A good starting point would be a treadmill exercise supervised stress at maximal capacity to assess your response and to see how you handle that situation. There is no blanket yes or no answer, rather a carefully thought out approach with exercise testing would answer the question. Very impressed that you are doing yeomen service to society through this forum.My salutations to you. From being a weight lifter at college to becoming a heart patient i have come a long way it looks like. Had a cardiogenic shock in Dec 2005 followed by a CABG(LAD-LIMA) in 2006.EF around 42-43. Prescribed Cardace 1.25mg,Ecospirin 75 mg,Stanlip 145 mg and Concor 1.25 mg. Took them regularly upto about a year ago.Stopped Stanlip as advised by a non-cardio surgeon.Stopped Concor as i felt giddy after taking the same.Stopped Cardace as i felt it didnt make any dent, BP being normal.Continuing only Ecospirin 75 mg. I feel pretty normal.Can carry weights upto 5 kg and walk 3-4 kms.Run about 50 kms a week on my scooter in Bangalore traffic. covering 5000kms in April-July ,2016. Very honestly not gone for a check up in last two years.No smoking or drinking.Not a diabetic. Am i making a mistake somewhere? With the best of regards. I would advise you have at least yearly follow up, if your ejection fraction is low then you would likely benefit from a beta blocker and an ACE inhibitor medication. Its possible that if an intervention is required this time that stent placement may be preferred if possible to avoid another surgery. Im 51 and double bypass surgery on 2/7/17. I never smoked, don’t drink, eat pretty good. Im a worrier, father of 4, not over weight. Also no family history of heart disease. I had LIMA to LAD, LRA to major diagonal branch of LAD. Ok so I have to eat even better and now exercise. My LAD had a 90%blockage, there was also 2 70% on the left and 30% and 50% on the right, which they didn’t fix, should they have? It sounds like you had the appropriate bypasses , i wouldn’t not worry if you are without symptoms and concentrate on life long risk factor modification. My partner is obese and small in height. He has high blood pressure and cholesterol. He has been on medication for this for over 20 years. He has just had a triple by pass using SVG vein in leg. How can I care for him so he has the best outcome in the years ahead? Exercise, diet, no smoking, compliance with medication, control of blood pressure and diabetes, regular check ups, healthy lifestyle. done to check the internals of the arteries. Stress tests are good but only the cath really tells you how things are functioning in the arteries. Cath should not be performed unless symptoms appear or stress studies are concerning. Also i wouldn’t be to avoidant of CPAP, it can significantly improve symptoms and cardiovascular risk. My 69 year old brother had a stent put in about 2 years ago and then about 18 months later had 6 bypasses done. I worry about him as he lives alone, considers he no longer has heart issues because his “heart has been fixed” and continues a completely sedentary lifestyle, lives on takeaway food etc. He has had a constant ‘frog in the throat, for a long time, he no longer goes for follow up appointments. Am I correct to worry about him. You are correct to encourage him to pay attention to risk factors and lifestyle as its proven to help. I had my triple bypass done in 1992 and I was 38. Since than I had stent put in 2010 on the opposite side. The original arteries were still open. I led a normal life eat normal food and do regular exercise. I’m now 62 years old feel tired sometimes, I was wondering if I need to revisit the original arteries now? Would start with some form of stress testing. I am 28 yrs old from India , i had two cardiac stroke few weeks ago, after second stroke i was admitted in the hospital ECG reports were normal but the Troponin-T showed enzymes then i was advised for Angiography by the doctor there. My angio showed type 3 vessel, ostio-proximal irregular-50-60% lesion, mid segment has 99% lesion, further down distally mid segment has 70% lesion, distal vessel is good , graft-able DI fair sized vessel, ostial mild disease. being non diabetic and preserved LVEF i am leaning more towards multi vessel stenting. CABG is definitely an option, but given age i would rather reserve the surgery for later date. The bypass grafts last for 10-15 years and If they end up using the LIMA graft now for CABG my options would get very limited later. Additionally i should be on aggressive medical therapy and vegetarian diet to slow the plaque progression. what would you advise in my case. In general with complex 3 vessel disease surgery would be advised. The long term patency of stents is questionable particularly given that you are so young and have a clearly aggressive form of coronary artery disease. My father is 57 years old and recently suffered a mild heart attack which was his first attack. Later reports showed that he had 5 blockages with one being as high as 90%,3 in the range of 60-70% and one 40%. The doctors have suggested a bypass surgery. Is it safe and what is the life expectancy after that. Are there any chances of another operation in the near future due to reclogging of arteries. With multiple blockages like described, bypass surgery would be recommended in most cases of it is felt he is a decent candidate, this can last a long time and be effective. I had open heart surgery in 1971 to repair Atrial Septal Defect and a bypass was added to the lungs from the heart. I wrestled in high school and college, ran a marathon and continue to race horses at age 54. How long will this bypass work and is there anything I should look for as I age? Or is ignorance a very good thing in this case? Do you have specific details of the operation report? Do you have details of a recent echocardiogram? I have been trying to get records from Cleveland, but they destroy them after 22 years. I haven’t given up hope and have a couple more avenues to follow for records. No recent echocardiogram has been taken, but my GP has taken yearly EKG’s and hasn’t been alarmed. I am a 76 year old female with coronary artery disease and stage 3 kidney disease. At 39 I had a triple Bypass done at Brigham & Women’s Hospital using the SVG vein. I live in an underserved area of the NW and must travel nearly 3 hours for good medical treatment in Seattle. Prior to moving here I lived in Boulder, Colorado and was treated at the University of Colorado Medical Center. In January of this year I suffered a heart attack and had a stent put in my heart. Seeing a Cardiologist at the University of WA in Seattle is so difficult that recently I returned to Colorado for medical care. In January of this year I suffered a heart attack and an angiogram was done of one side of my heart and a stent placed. I was told that I could not have a full angiogram because the dye is too great a risk to kidneys. The soonest appointment I could get was in July of this year so I returned to the University of Colorado Medical Center in Denver and saw my former cardiologist. I was given a work up and had a resting nuclear stress test which showed the LDA was blocked and I was advised that it was not possible to stent. Because of the kidney disease I was told that bypass surgery was a very high risk. My Colorado Cardiologist said that my cholesterol drug is not working as well as it once was and that since I am unable to take a Statin, have never smoked and live a healthy life I am a good candidate for the CSL 112 infusion. I have been referred to and accepted by a new cardiologist in Seattle. After the stress test I was put on 25 mg of Metoprolol once a day and I have suffered numerous side effects which include but are not limited to dizziness, dimming vision, itching, insomnia and burning mouth syndrome. I ceased taking Metoprolol today as my quality of life is unbearable on this drug. Can you suggest a course of action that I might discuss with my cardiologist ? If you are having such side effects from metoprolol i would recommend discussing alternatives and agree to not taking a drug if it is associated with quality of life affecting symptoms although other beta blockers may be better tolerated in some people. In terms of the coronary artery disease, medical treatment can be particularly effective in stabilizing the disease and helping symptoms. Even in the setting of full blockage of arteries, it has often been showing there is no clear long term effect from procedures to open up the artery. Why still Veins are used when Radial artery or RIMA available? The arteries typically last long and give better survival rates? LIMA survival advantage is well established. The patency of radial and RIMA grafts is there in theory but less well established and therefore for the extra technical skill required and also the time, many don’t do it routinely. Routine angiography is rarely ever recommended in asymptomatic, instead symptomatic approaches with use of modalities such as stress testing is recommended. Of course if symptoms develop the situation changes. My husband had a heart bypass last 9 years ago now we are facing 6 blocked arteries. 0ur cardiologist told us no to angioplastic and to another heart bypass surgeryagain. Only medicines maintenance. Is our doctor’s right about this? Do you have more details of the reports of the tests and such? I am a 38 y/o female who is 2 weeks post single cabg using Lima to bypass LAD. My LAD was 80% occluded in 9/2015 which I was stented for (age 36), that stent reoccluded @ 99% 7 months later (6/16) and 3 weeks ago I began experiencing some shortness of breath before a routine yearly stress test and had positive ischemic changes on both stress ekg and nuclear images. That landed me back in the cath lab with a 99% occluded stent again. My EV is normal, the rest of my arteries in my heart are “wide open” and I have never had a MI. My overall health besides my CAD is good. Slightly overweight, but excellent cholesterol and bp (without meds, but am taking meds anyway)non smoker, no diabetes. They believe my Stents clogged up because of scar tissue, and that the initial blockage is some congenital issue with that section of my artery because other than family history, I had no “risk factors” at my age to have such a significant blockage in my LAD. My cardiologist said it was a freak occurance. My question is this: are there any long term survival studies for people my age that have these crazy and medically unexpected cardiac situations? I don’t fit a cardiac profile and I just would like to get some information to have some semblance of peace of mind about how long I can “expect” this bypass to stay open. The likelihood of my graft scarring down. Im not sure why the stent occluded, i would have to look at the original images to give you reasonable insight. Did the Dr doing the test use IVUS imaging? That is what i would have used to characterize the blockage in the stent and help work out why it happened. Regardless, the good news is you now have a LIMA. The LIMA is very unlikely to block off, and is considered the gold standard of bypasses. I see LIMA’s in action everyday and they are almost always patent. I am a 61 yr old male, and in Dec. 2011 I had a CABG x 3 using both LIMA and CVG. I have not had any chest pains or heart attack symptoms since that time, but I do have some shortness of breath. This could be due to lack of exercise and I am about 100lbs overweight, which I am making serious lifestyle changes to remedy that. The above article keeps asking the question “How long will the bypass last?”, and the best answer given was about 10 years. Are there any cases where the bypass lasts longer than this? I am approaching 6 years since the surgery and I had such a bad post-op recovery I can’t bear the thought of going through that again in 3 or 4 years. Are there any treatments on the horizon that can clear blocked arteries that are non-invasive, other than statin drugs that have side-effects? 1. if you are maintaining an EF of 25 or less . Your have been living with Cong heart failure for 40 + years. 1st open heart at 20 to put mechanical heart valve in . Heart failed due To rheumatic fever. 11 years later that valve goes bad and another open heart is done in 1981 to put another mechanical valve( Bjork-Shirley) defective come to find out . After two years on extreme heArt function meds installed Device pacemaker put in as well … no improvement, heart failure is progressing. Would this constitute diagnosing Adv heart failure ? If so would you consider LVAD insert, if patient could withstand that process. What Dr or Group is over LVAD implant at Princeton? 2. Would you offer patient Heart Transplant information? Are heart transplants performed there? 3. What if patient was not healthy and would never be a candidate for transplant or LVAD ? What would be your next step? 4. What are your thoughts on Intrope ( Doumbatine) ( milrinone) therapy given to a patient in home ( hospice) at end stage adv heart failure. In this case there is severe systolic ventricular dysfunction. The degree of dysfunction is severe and in that respect it is advanced. A lot of it comes down to symptoms and response to medical treatment also. Yes there is advanced heart failure. In my opinion, someone in this situation, with this history absolutely needs to be under the care of a physician with specialist training in heart failure, most of whom nowadays have completed specialist training in this. The decision to implant LVAD is a complex one and needs a multidisciplinary team approach. Transplant is even more so dependent on such an approach. The next step here is to seek the care of a heart failure specialist in a dedicated center with access to transplant and VAD so that all the options can be discussed. My personal specialty is mode dedicated minimally invasive approaches to structural and valvular heart disease and complex coronary procedures. The VAD’s I place are short term only and for those who are acutely decompensated and unstable. My advice would be to seek transplant/VAD care at a place that is practical in terms of follow up as follow up will be key and you will need to be in close contact with the center and be able to travel for emergent and routine care. The decision to pursue advanced therapies for heart failure is as much a lifestyle decision as a medical decision and needs a great deal of due consideration. With regards to those patients that are not candidates for advanced therapies, a palliative approach to symptoms can be considered. Although home inotrope therapy is not associated with a survival benefit, it may importantly serve to increase quality of life in select patients. Hi, I am 77 now and had my triple CABG in Sept 2006 with no damage to heart at all. During routine check, ischemic changes were noticed and on angiography, since triple vessels were found blocked ranging from 85 to 90%, EF at 72% and no diabetes, I was advised to have CABG done as a safety measure. I had it done, successfully. My TMT done 6 months ago is negative at 9.5 minutes and EF 55%. I follow regular veg diet, moderate walking exercise and regular check ups. No problem appears so far but of late, feel bit lethargic and tired. Do you advise an angiography for safety? 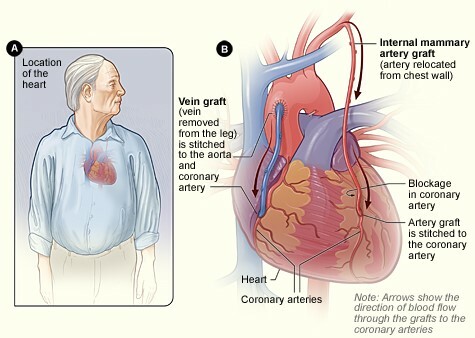 The procedure adopted in my case was LIMA and vein graft. My lipid and other all parameters are normal. I think the most appropriate option in your case would be to have a stress test performed, angiography would only be advised if your symptoms were to become unstable. Do you have specific details of the report? I would certainly recommend seeking opinion on bypass surgery which is in many cases used for triple vessel disease with complex anatomy. My dad has just been told he needs to go for triple heart bypass and from what he’s told me it will be SVG. Can Lima not be used at all for a triple heart bypass? It’s has the highest success rate when it comes to longevity ad I what my dad to live for as long as possible. The LIMA is used to the LAD artery, typically this is most important and likely to last a long time. The LIMA is not used on the other arteries when used on the LAD. The SVG will be used to the other 2 vessels and although not lasting as long as the LIMA, they can last a long time. My name is S.S. Bajaj; I am an Indian and had bye pass surgery in Feb. 2004; in my case grafting was done with the veins taken from my legs. So far the going has been good and I am taking medicine regularly with regular yearly check ups. I do not have any other illness like sugar or high B.P. Also, my weight has always been less by about 5 kg or so than the ideal weight. I am very strict about dies; I am a vegetarian. I exercise REGULARLY for about 60-90 minutes daily. So far the going after surgery in 2004 has been smooth. What is the probability of another surgery, should it happen. There is no way to predict exactly if there will be a need for any intervention however attention to lifestyle, medication and risk factors reduces the chance. I have read many of your articles and viewed the videos and find them extremely informing. Thank you for making them available. I am a 67 y/o male. CABG x 5 2002, 2 stents 04/2016, 3 stents 06/2017. I quit smoking in 1982 and have been very active since including almost daily workouts in a gym,doing both aerobic activity and weights. I had to stop working out in Dec 2016 due to angina symptoms. Below is my latest report from the interventionist. I would appreciate any input and/or recommendations you may offer. I am awaiting cardiac rehab so I can get back to exercising while being monitored. Mr. P**** has a history of CABG (x5…2002) and PCIs (5 since 04/2016). He has known severe coronary disease and has been experiencing recurrent class III and IV angina. occluded in its proximal segment and the vein graft to two obtuse marginals was occluded. The OMs were visualized via multiple collateral sources. The RCA is occluded and the RIMA graft to the RCA is widely patent however there is severe obstructive disease distal to the RIMA graft anastomosis and severe obstructive disease in the PDA. The LV systolic function appeared normal. Mr. P**** underwent stenting of the distal RCA with DESs. The was remaining significant obstructive disease distal to the stented segment in the PDA. Mr. P**** is not an ideal candidate for further revascularization. I certainly do not feel he is a candidate for CABG given the diffuse nature of the coronary disease. 1) further stenting of the RCA system however this would best be done with a 2.0 mm drug-eluting stent which is not presently available but may be available in the very near future. I would favor having him return to the cath lab for further stenting of the RCA if and when this stent becomes available. 2) stenting of the LAD distal to the LIMA graft anastomosis. Although this lesion is unlikely to be the only cause of his chest discomfort, and may not be contributing at all, it is possible that stenting this segment would reduce his ischemic burden. 3) the diagonals and not amenable to percutaneous revascularization. 4) the circumflex system is chronically occluded. Angioplasty of this system is feasible but would be very challenging and be associated with a somewhat high risk. If this were to be attempted it should be done only after obtaining the prior angiograms so that a more clear roadmap could be had. Hi Jeff, i really would need to see the films to comment. What we know is that you have severe CAD and although you have had bypass there is residual significant disease. I would recommend a stress test with imaging to help delineate ischemic areas and also a possible second opinion from an experienced interventionalist. Most times I avoid articles such as these but I am glad I read it. 12 years post Op and I had a 4 way bypass. I made several changes to my life. Was never overweight or a smoker. I enjoy beer and wine and the BP is a bit high. For 63 I exercise extensively all year around. My current obsession is cycling. On Saturdays II go for 10, 20 sometimes 30 miles over 3+ hours in the heat. No pain and the heart performs well for my age. My cardiologist even allowed me to skip a planned stress test because the previous one plus my fitness was so good although we are doing one next month. I encourage patients to get off the couch and remain positive. We owe it to our families and caregivers. Thank you Dr Amhed for your work. Glad you found it useful. Sounds like you are doing great. I’m not a heart patient, but I’m writing to compliment you on the very substantial amount of time and energy you’ve devoted to answering the questions of those in need. You give doctoring a good name! Bless you. My husband had a quad bypass 2.5 years ago at age 52. He is now having chest discomfort (same feeling he had before bypass). Spent the day at A&E having all the usual tests done, troponin levels all ok. I guess the next step for him will be to follow up with GP to go from here. For my age at 41, I am quite young for CABG, but I was operated for a 3xcabg last november. One was done with Lima. One from my left arm vein and one from left leg. Its close to an year now. My doc said you need to be evaluated on completion of 1 year as blockages can reappear. I am doing fairly good but sometimes feel some pain in the left portion of body. I usually walk about one and a half hour every day with occasional day off’s. I am not on a very strict diet. I eat what I want but in moderation. Drinks, yes once in a week, about 2 bottles of beer. My father also had CABG at age 49 and he passed away at 56. But given the fact that CABG is not a complete cure and blockages may reappear, I am a bit frightened. Based on my history as given above, what chances do I stand, although the above posts infuse rays of hope in me. But I would like an advise from your side as an expert. If done well bypass can last a long time, in fact the LIMA can last lifelong. In terms of check up i hope they are referring to a clinical exam or at most a stress test and not angiography. Angiography is not advised unless symptoms are advanced or unstable. Thanks Dr. Mustafa, yes its a routine clinical test/stress test. What do you suggest for diet do’s and dont’s. I have quit smoking a year back. Also if I can resume weight training ever again ? Thanks. Sometimes when the blockage is towards the end of the vessel where it is smaller, it is wiser not to place a stent as it can do more harm than good. Often the disease there may stabilize with medicine alone and medical therapy is the advised options. I have seen cases where people have tried to place stents very distal in the vessel and led to significant complications and issues. In this case it sounds like the plan may be appropriate. I’m Azhar and age 45, I got an heart attack in Apr,2016 and being put a stent, after that I always got angina. In mid 2017 i done stress test and they decide to do for angioram again on 14sept 2017. -Previous Percutaneous Coronary Intervention to Left Anterior Descending, Right Coronary Artery. And they say solution is CABG. 1.May I know in my situation how many Lima and SVG needed? 2.On this comment date 30th sept 2017 and my next appointment at 1st Nov 2017, in my condition can it wait? 3.Are my option only CABG? 4.In your experience Dr., are there any other option than CABG? and in my situation now I don’t know what to do or not to do in my daily activities. If your dr feels you are stable, light activity would be advised as tolerated. Thank for your kindness reply, how can i send u the picture of the angiogram? I had a copy of it. ***CABG would be preferred based on the info you provided if you are felt to be a suitable candidate. Base on my current condition? If my option is bypass. If i totally change my lifestyle regarding my diet and all related to health and I devote to it fully. Will it be a good solution for me to skip the bypass. I just want to know if it possible or not? I asked my cardiologist what happens after around 10 years and my bypass’s wear out. He said that’s it. I said can’t you replace the bypass’s or something? He said no. I said so I will just die then? He said yes. Is he being honest with me or does he just not like me? He’s not being very honest with you unless your heart is already a total wreck! I had a by-pass in March 1978 at age 31. I’m still here. I guess you are older than I was and this makes a difference. Generally speaking, if you survive 10 years your life expectancy is undiminished. Enjoy life, quit smoking, eat wisely and take plenty of exercise and forget that you ever had heart troubles. Do this and you are LESS likely to die of a heart attack than the average person as you are now fully aware of the symptoms and risks of imminent problems and more likely to take, early life saving action. I had a triple bypass 23 years ago at 47. One artery was the LAD so they used the LIMA for that one. Now at 70, I was having chest pain and it turned out the LAD was 90% blocked, another artery was 100% blocked and a third was 70% blocked. Doctor did a stent on the LAD but then said something about a bypass for the LAD. I’m having a stress test tomorrow and then they’ll decide the next step. If they decide to bypass the LAD, is there another artery they can use and if not, would they use a vein? From everything I’ve read, usually they like to bypass the LAD, not stent it. Personally if the LIMA to the LAD failed, and there was a need for intervention on the LAD, a percutaneous intervention may be preferred. It is a matter of debate concerning bypass surgery without use of the LIMA. If there are multiple critical blockages without good interventional options and there is the possibility of using arterial conduits then bypass may be more appealing. Discuss the advantages and disadvantages of both these approaches with a good surgeon and a skilled interventional cardiologist with experience of complex cases. My triple at 47 has lasted 23 years. My surgeon years ago told me I should get 15 years out of it and then they’d do it again so I might live to be 75-77. Not bad according to him. My main artery graft failed and I opted for a stent rather than bypass surgery again. The other two vein grafts has also narrowed. One is 100% closed but the doctor said somehow veins have formed around the closure so blood is flowing. The other one is 70% closed so he may stent that one soon. I’m grateful that the grafts have lasted this long and we’ll see how long the stents last now I guess. I never had a heart attack and even this time, I got a warning sign but not a heart attack. And the surgeon said my heart muscle is very strong. So we all do the best we can do with this disease. Good luck to all. I had triple bypass in December 2015.Can you advise if I need an evaluation now two years later and where should I do it. You should have a regular check up from a Dr. If you develop symptoms, that is in general the time for further evaluation. Its severly cold in Nprthern Michigan. I also am off balance and get dizzy when riding in a car.Cant drive safely.I am wondering how log this will last.I was a trucker for 30 years.Desperate in Michigan. I think its important to ensure whats causing the symptoms first, by the 16 month point you should certainly have improved. The first step should be medical evaluation to see if any recommendations can be made to improve quality of life. Also a cardiac rehabilitation program may be of use. My father (64 years) had a bypass surgery 3 years back with 90% blockages in 3 arteries. Now the problem is his Blood Pressure and Blood Sugar is not in control (200/105 blood pressure and 380 random blood sugar). What might be the cause ? Shall we do one more time angiography to check for blockages. Please give your inputs. Also following a strict diet. He needs to see a diabetic specialist and a blood pressure specialist. Those values are dangerously high. I would make sure you have seen a medical provider to ensure your symptoms are stable. If so then a stress test may well be appropriate and can look in to whether the symptoms are related to the heart and determine the next step. I would think the chances of needing another open heart surgery are tiny. – Sequential Aortocoronar venous bypass on the RIM and Remus. From the above information, can I conclude the bypass on the RIM and Remus are more prone to have blockages after some years? My husband had quadruple bypass surgery in June 2000 and it has now been eighteen years since he was brought back from the dead. He had a stent put in around October 2006 and he has been fine ever since. He now has to deal with Parkinson’s Disease. I lost my Dad recently due to dementia and heart disease. Live the best life you can because you have only one chance to get it right! My cousin had the bybass in the age of 15 years and he have the all habits like drinking and pan…recently he had admitted in hospital for 10 days due to the his habits his stomach spoiled..
can you please tell me how long his life if he continue like this…. I had a quad 4 months ago still experiencing discomfort in my chest. Structual I beleive but sometimes it feels like angina. How common is this? On the good side my diet has improved and I walk two miles a day and ride the eliptical for two miles. I thought that studies have shown that stents are not effective, long term. Not the case at all. Stents are preferable in some scenarios and bypass preferable in others. Hello Doctor Ahmed, I hope all is well. I’m 53 and a active Firefighter/Paramedic for 28 years now. I had a inferior MI at age 45 with 3 stents placed LAD had 2 with 90% blockage. I had good results for 3 years then had the typical left jaw pain while on the job. end results I had emergency CABG 4 vessels. I have an extensive family history of heart disease. My question is I’m on coreg, altace, Plavix, niacin, crestor, and asa. and I still cant get my good cholesterol up and my bad down. my tri’s are staying in the 600’s as well. not a heavy consumer of etoh a non smoker and try to exercise and eat healthy. I need to lose some weight but I can’t seem to cross over the bridge to feeling and getting heart healthy again. any suggestions? or am I doomed to family genetics? Should probably try a low carb type diet (like keto or other) to see if that cant sort the triglyceride issue. I had cabg x2 in 1995. Using artery in my arm. Just had mi n stent put in. Dr said my grafts from 23 yrs ago look great. Never a problem with them till now n this was a artery that wasn’t bypassed in ‘95. Wow. This is amazing. How old were you when you had your cabg. I had quadrouple and worry all the time. 65 non smoker, non diabetic, non drinker. Exercise regularly. 1 and a half years now since surgery. I eat well. I had 99% blockage. Would love to hear from you. 12 years agoI had CABG, 3 arteries blocked. No problems since, take statin drug daily along with Coversyl. Lifestyle changes made a big difference. So, you’re saying you have NO blockage after 2 years? That’s wonderful. My husband just got home from 5 bypass surgery and aorta aneurysm graft. Nicked twice in lungs and bled for 15 days!! I’m so concerned with his health. Because arteries taken from leg don’t have a great outcome. I pray for your continued health.. I too had CABGx5. I am 59 in excellent health, eat well nonsmoker, compete in natl Handball tournament. My doctor and I was shocked to find 11 blockages. My father died 30yra ago at 49yoa during bypass surgery. So I too am concern on how long my grafts will last. Thank you for this site! My husband (60y/o) had a heart attack last week and was in hospital for 7 days. Cath showed 8 blockages of 75% or more and 100% in LAD. LAD firmed it’s own Bypass to RAD. 2nd Echo showed 45% ejection rate and anterior wall damage but is showing some movement again. Troponin went to 53. Surgeon decided to delay surgery for 6 weeks to let heart get stronger. I’ve read some medical reports about delayed surgery. He had No prior symptoms- performed high intensity workouts 4x/wk. it is due to genetic cholesterol that runs in family. He refused to take statins. My husband has researched statins and know the medical community is divided on the risks vs. benefits. Is this a good plan and I’m worried about another heart attack/ stroke while waiting? He just came home and is waiting for 6 weeks. No angina, clear EKG, vitals are normal. Thoughts? I cant really comment on the need or urgency of the situation since one would have to be directly involved to give you safe advice. There are many situations whereby surgery may be delayed after a heart attack to allow stability to ensue, however that is in disease determined to be stable. The absence of angina is reassuring here. If i was in that situation i wouldn’t avoid a statin based on scaremongering, rather id try what i could to stabilise the disease. They released us and said to take medicine for 15 days again doctors said take 15 days more medicine till date doctors said medice.without any check so total we wait 41 days ..
Sir what we have to do we are confused. 43 years back when I was of only 25 years old my serum cholestorel was 375 and LDL was 280 I stopped eating > red meat, egg, butter, and any fatty things after that I also stopped smoking. If fact I never drink !!!!!! but I never take any medicine as because at that time no good medicine was there !! and after 33years > suddenly I found that I am feeling suffocation if I began to walk and a pressure in my chest > immediately I consult doctor who advice me for ECG and Eco Cardio. but nothing has been found there > then I took admission in the hospital and after CAG it was found that 4 arteries were blocked. It was treated by putting 3 medicated stents and one balloon surgery. After 5 years I found again similar types of problem again I have consulted to the same doctor and after CAG he told me that the main 2 arteries are found blocked and these are new. I ask him if I can done open heart bypass surgery this time. The doctor assured me that he want to put stents again !! but after this surgery the problem still persists and I informed the doctor again he start various types of test one after another but nothing was found positive. Then I ask the doctor to do another CAG to see the problem. Doctor refused to do so. Then I was totally dependent on strict diet and medication. When I found it serious then I consulted another doctor [because at this time the previous doctor was away from our country and I do not know his contact > address or number or even email !!] and two blocked was found in the same place where two stent were putted. Now this doctor advised me for bypass surgery and I have done it. So there are 5 stents + 1 balloons + 2 grafting inside my heart !! Please tell me how to continue my normal duties. The bypass surgery was done on February 26, 2018 here in Kolkata. My father had an attack on 17 may and they admitted after 5 days they do ecg,echo and angiography and three blockage are found one is in LAD which is 100% other in LC is 80% other in RCA IS 60% left main is normal doctor said take 15 days medicine then we do CABG AFTER THAT THEY AGAIn said for 15 days medicine not we wait 41 days and again doctors said 15 days medicine without any check ..
My name is Debbie, 4yrs ago I had triple bypass. These past few months I find when I walk,exercise I am having the same pain in my hips,legs. Told Dr. said he did not believe it could be issues with my bypass. I am over-weight but trying to change my life style. 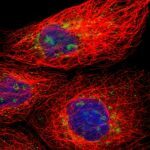 There are many unknown factors, such as environmental, inflammation and such. I got a quad by pass in 2004 I’ve not had any problems since I’ve started the Gym 2 months ago doing cardio and weights this last week I’ve been experiencing pain at the bottom middle front of my ribcage just asking because a guy I know had a by pass and he said he started feeling sore like that and thats when he knew he needed a new by-pass should I be worried or am I paranoid ? Get it evaluated, if anything, for reassurance. M husband had 5 bypasses at the age of 47 using the veins in his thigh. The doctor told him today he is an anomaly as he is 65 and never needed another surgery. Is this true? No it is perfectly common, hopefully he continues to do well. my father last year undergoes CABG surgery…now heart function is ok …he is in regular follow-up with doctors but after 3 months of surgery where there is Mark or we can say surgery line in chest there is small hole from which puss is coming .now it’s almost 6 months passed puss is still coming not in large amount but like wheat grain .doctors prescribed feronem and also informed us that one clip removed already and if still puss comes then they need to open one more clip .I’m so much worried about it.please guide me whether it’s critical isuue or what. Thank you and awaiting yours favourable reply. Its not possible to comment without evaluating the wound. It sounds like the managing team have it handled. I had CAB in May of 2017 for 4 blockages. I am 57 and also a runner. I run much slower than I use to bu I am running a marathon in October. I am not sure if that more age related than anything else.I am most concerned about how long the vein graft will last. I know the doctor used the LIMA artery to graft the LAD. To longevity of the veins seams to be bleak. I never had any chest pains before the surgery. I blacked out near the finish of a 12 mile run. What is typically done when the veins close or collapse? Hi I was diagnosed in March ds year after breathing issues. Had foot surgery then breathing. Saw cardiologist found 3 blockages. Went for 2 opinion. Say if da stinr it sure of problems later. 4 months post bypass and hectic breathing issues. Am Inot hospital at present. I believe my atheries were highly diseased according to thoracic surgeon. Any ideas on how I can get through ds.very depressed. Can’t walk on exercise. Severe plantar facitis. Always keep my self busy. Just da tiredness. Kindly share ideas. Kalidinreena@gmail.com. All depends on how stable your disease is. These questions require assessment from a specialist. Thank you all for your comments. At the end of July 2018 at the age if 45 I had a triple bypass. I’m writing in Nov 2018. Emotionally i have good days and bad days. This is because previous to my event I’ve always worked out. I did weights, walked, P90X, Insanity workouts, so it was very surprising when this happened to me. I’ve also always tried to eat healthy, altho i cheated from time to time. Oh, i nvr smoked altho my blood pressure has been high for quite some time. Since my surgery i lost 25 lbs, which I’m keeping off. The many stories I’ve read have been very encouraging. I’ve wondered have long my bypass will last. I’m trying to keep a good attitude, however I’m so worried about my arteries re-clogging up or the bypass somehow failing. I take my meds and my cholesterol is much better. Currently i am having a problem with keeping my blood pressure under control. Which confuses me since i lost weight and eat more pristine than ever and work out about 4 or 5 days a week. Good to know I’m not alone on this journey and others are living marvelous lives. Thank you. I had CABG in 2004 in Penang, Malaysia. Had a heart attack in 2018. Is it advisable to do second bypass? Iam 64 years old(2019). Depends on a thorough evaluation by an experienced team. I’m 72 had a quad when I was 50 I’m 72 and feeling pretty well. Not running a five K but don’t think many 72 yr old’s are either. I exercise daily and try to stay away from the rib eyes. Still a little uneasy about the future but probably had I never had the By-pass I would still be concerned. My advise to anyone is to keep moving and eat right “most of the time”. I had six bypasses in1999 at 48. I had surgery last August to clean out my right carotid artery. My left is 100% blocked. I do not smoke or drink and I weigh 165 lbs. Should I have a stress test to determine if my heart is blocking up again. I will be 68 in May and would like to retire-I worry about how much longer I will live. In general testing is reserved for those having symptoms heart failure by symptoms or imaging. Also, no reason you cant do well for a long time! Gud day Dr mustafa…i am Fernando from the Philippines… Have single bypass last January 7, 2019 with left internal mammary artery graft… How this procedure last? I read so many articles about the superiority of LIMA… Can i live 30 years more with renewed healthy lifestyle? The LIMA is an excellent graft that can last decades and do ask excellent job. Traveling months after bypass surgery is typically fine if the post operative follow up was without issue and symptoms are stable.